Ranches are romantic, especially when you think of the Ponderosa as an example. 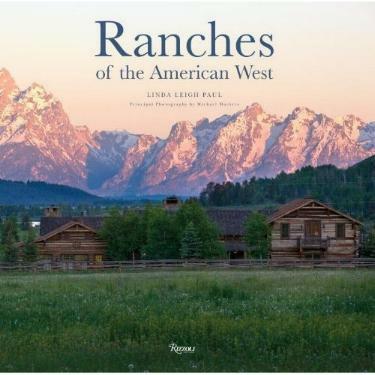 This stunning book features twenty five ranches out West, in Wyoming, Colorado, Montana, California, Oregon, New Mexico, and Texas, and showcases the architecture and functionality of the ranches today. Not only are celebrities moving to ranches, but so-inclined custodians using specialist architects too, changing the design from what you'd typically expect out West to something incredibly beautiful. A lot of what's on offer in this book reflects the architecture (remember, in the old days the homesteads had to fit in to the surrounds and be able to withstand the harsh winters in certain places yet remain places of work) which has changed and continues to change. You'll notice that many homes still fit into the landscape, thankfully, but many resemble country club estates, and I'd hate to imagine their heating bills in the northern states! I hope they have solar panels. Many of these ranches were built using local materials and the ranch owners use local artists' works to decorate their homes. Some of the ranches offer an historical background, adding interest and atmosphere. Sumptuous and/or homely is how I'd describe some of the homes featured, some ornate and/or just plain cluttered, and most work with Nature. My favorite ranch houses are on pages 72 and 234. Best views are on pages 94/95 and 142. My favorite inside of a ranch house is on page 243 although the one on page 21 is also appealing. My favorite ranch settings are on pages 39, 81, 122, and 154. I loved the kitchen on page 195. One question: Isn't Arizona, Nevada, Idaho and Utah in the West? Conclusion - An exquisite coffee table book for all you dreamers.